Woody Allen's Midnight in Paris is one of the most pleasant films I've ever seen from the director. The romance, perfect for a matinee, plugs Owen Wilson into the role of Woody surrogate, Gil, a disillusioned screenwriter vacationing with his fiancée and her family in Paris. Most dreamers, myself included, can find echoes of wishful longing in Gil's grass-is-always-greener contention that Paris is better-suited for an artist than any American city—least of all, Malibu, where Gil's obnoxiously nouveau riche girlfriend (played by an appropriately abrasive Rachel McAdams) wishes the couple to live. Were this the simple premise of the film, Allen might still get a lot of mileage from the European setting, as he did in his last minor success, Vicky Cristina Barcelona (2008). But Allen mixes some of the magic from 1985's The Purple Rose of Cairo to transport Gil to, what he imagines as the Golden Age, Paris of the 1920s—where he encounters many of the Lost Generation: Hemingway, Stein, Picasso, Dalí, the Fitzgeralds, and others. There Gil falls in love with Picasso's girlfriend, played by a glowing Marion Cotillard as the ultimate muse. The most amusing twist occurs when the two starcrossed lovers learn that every individual has their own opinion of what the Golden Age actually is. Kung Fu Panda 2 credits two unorthodox talents, director Guillermo del Toro (Pan's Labyrinth) and screenwriter Charlie Kaufman (Being John Malkovich), as creative consultants. This is quite surprising given the movie's rather conventional "Mythic Hero's Origin 101" storyline, which owes more to Joseph Campbell than anyone else. The titular panda, Po (Jack Black) finally realizes he was adopted by his father, a goose. This leads him on a spiritual journey that sees the glimmer of a romantic relationship with fellow warrior Tigress (Angelina Jolie... I bet Black wishes the next film were live-action) and a confrontation with Lord Shen (Gary Oldman), a proud peacock who employs the nascent technology of fireworks to terrorize his city, and hopefully, one day, all of China. Kung Fu Panda 2's strong points, much like its predecessor's, lie in its dazzling visuals. I can't think of an animated film, hand-drawn or CGI, in which every frame is as preoccupied with inventive lighting and color as the first Kung Fu Panda (2008) since, maybe, Disney's Sleeping Beauty (1959). For animation fans, Kung Fu Panda 2 proves to be just as rewarding a treat. The introduction of Shen's pyrotechnics into this world offers the Dreamworks Animation artists a chance to push the art into ever more dynamic and propulsive visual sequences, setting a high bar of expectation for the next entry in this animated movie series. Unfortunately, Rio doesn't quite measure up to its animated competition. Given its carnival setting, the tale of Blu (Jesse Eisenberg), a macaw who finds love with a female (Anne Hathaway) of his rare species while lost in Rio de Janeiro, has the potential to provide a colorful, musical, and joyful atmosphere with a minimum of contrivances. Unfortunately it squanders its easy promise by falling back on old tropes of animal captures and flights to freedom to create unnecessary dramatic jeopardy. Charming interludes of romance against Brazil's celebratory Carnaval atmosphere get lost in the shuffle. 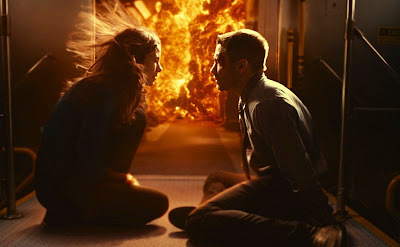 In Source Code, the jeopardy is real, as army pilot Colter Stevens (Jake Gyllenhaal) must relive the last 8 minutes of a train passenger's life before a bomb goes off, each replay getting him closer to solving who planted the bomb. Gyllenhaal is positioned opposite two very different actresses to great effect, Vera Farmiga as the Air Force officer who guides him through the mission and Michelle Monaghan as a victim of the bombing who the soldier starts falling for. The movie is a solid follow up to Duncan Jones' feature debut, Moon (2009). Like that film, issues of identity and metaphysics are explored against a hard science fiction backdrop (or the closest thing to pass for it in American cinema, anyway). The twists in this thriller are unpredictable yet come dangerously close to falling short of fully satisfying because of its treacliness. Ultimately, Gyllenhaal exonerates Source Code, however, with an earnest performance that overcomes any overt sentimentality in the material. Having lived in Paris during my misspent youth, I very much want to see "Midnight in Paris." Glad to hear you enjoyed it. Agree that "Kung Fu Panda" was visually stunning. Movie didn't stay with me much after the final credits though. I was pleasantly surprised by "Source Code." It sounded silly (and it sort of was), but the action and science kept me engrossed. I walked out very satisfied. 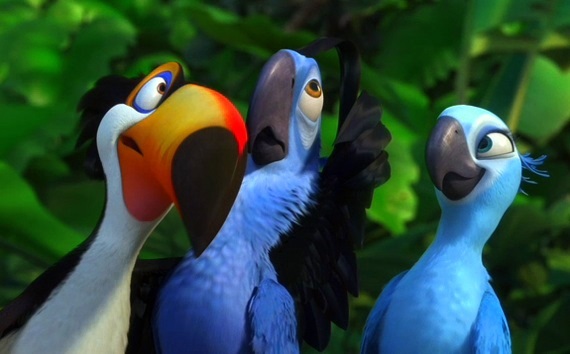 I can only hope and pray that I never - even by accident - see a frame of "Rio." Thanks for commenting, Chris. I didn't know you lived in Paris. I would love to hear about that, either here or on Facebook. I'm sure my wife will be ecstatic if you can dispel any of my dreams of becoming an American expatriate living in the City of Lights.